Usually I do the top ten novels I read over the year, but this year I had a list of 12 top reads from the 167 books I read in 2017. And I realized that there were four that stood out from the list. So I've narrowed it down to my top four. By far, my favorite book of the year was The Snow Child, by Eowyn Ivey. It's a great fiction read for winter, so go get yourself a copy now! I also loved The Dressage Chronicles by Karen McGoldrick (I also read one of the sequels). This is probably not going to go over well with readers unless they are horse enthusiasts, but I enjoyed it so much. I actually read a book for the second time this year, which is unusual for me. Last time I read it I was about twelve years old. My grandfather recommended it to me. House of a Thousand Lanterns by Victoria Holt. It did not disappoint. I was surprised by what a great read this was. Finally, a nonfiction read. The Stranger in the Woods by Michael Finkel, about a hermit that lived in the Maine woods alone for over 20 years. Readers, do you have any books you want to recommend for me in 2018? Here's a great book you should read to the boys! Red Sails to Capri. Author is Ann Weil. I love it! My kids liked it too. The mother in the story just cracks me up...I can so easily see her in the kitchen. I think you and I are the "most reading people" ever. These books all sound good, especially the non-fiction. I'm going to hunt that one up. Your reads sounded interesting Lisa. Nothing beats a great book does it - and reading 167 is an amazing feat! My top favorite read in 2017 was definitely Anthony Doerr's 'All the Light We Cannot See'. I too have decided to re-read a few older books I've kept as favorites and will soon return to 'The House on an Irish Hillside' by Felicity Hayes-McCoy. I read it after returning from my trip to Ireland in 2016 and would so love to move there!!! Another old longtime top favorite is Eugenie Fraser's 'The House by the Dvina - A Russian Childhood' - my third reading of this one may come soon! You can check these on Amazon if you want to see more. Two others I've read recently were 'The Lilac Girls' - heart wrenching and so sad at times - and just read 'Paris Apartment' which was disappointing for me, and I so disliked the main character I almost didn't bother to finish it because of her! Stay warm - it's better here now but colder weather coming back by the weekend. Oh, I read The Snow Child awhile back...LOVED it too! Have you read "Dollbaby"? It was one of my most recent faves. I am reading "Born to Run" by Springsteen, but I find it a long, boring read and doubt I will finish it. You read 167 books in 2017?? Wow!! I have a lot of catching up to do. Yes, your books! I will look each one up on Amazon. Victoria Holt!! I used to read her books when I was newly married. I loved them. Sadly, I cannot recall offhand a single title! I will check out your favorite! Thanks for the recommendation! Nice! We were on the same wave length. 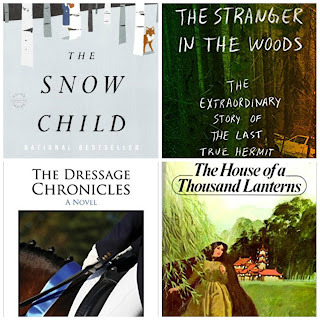 But then, I suppose you have to do a best books post at the beginning of the year, eh? Wow! You read a lot of books this past year. I also read The Snow Child and thought it was great. I had originally thought it was a middle grade book, but soon realized it was for adults. :) I agree that it is great for this time of year! I haven't read the other books you mentioned, but I am curious about them now! 167 books is impressive! I read 86 and some of those were picture books. I am reading thrillers that I got for Christmas right now--finished Final Girls and Midnight Line. The second one had some interesting and sad characters who were wounded vets addicted to painkillers--it explored why people might get addicted and how complex it all can be. Now I'm reading The Widow by Fiona Barton. Good so far. I have read about The Snow Child on Amazon, but cannot find age recommendations. What do you think about Anne Marie? She is 11 now. It looks so good! I don't think I'd read a dressage book, and I don't know a lot about horses. But I am very drawn to pictures of them and have actually purchased two paintings of horses. I will look these books up! I am enjoying returning to my books...something I did not have much time for last year. Happy 2018! It is so kind and gratifying to see that you've selected "The Stranger in the Woods" as one of your favorite reads. I appreciate the mention, and I'm touched that you found the story of Christopher Knight (the hermit) to be interesting. Happy to hear your recommendations. I'm overdue to read simply for pleasure.